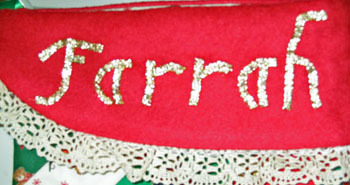 I finished putting Farrah’s name on her stocking just in time! I was actually asked to put it on both sides, but hopefully one side will be sufficient. I can add the other side after Christmas. And maybe straighten out the “h”. I’m not very happy with the way that came out. Actually, I’m not very happy with the whole thing. But hopefully M and Farrah will be happy with it — that’s what’s important. As always, click on the picture to embiggen. Former New York police commissioner Bernard Kerik has abruptly withdrawn his nomination for Homeland Security Secretary. Kerik said in a withdrawal letter to Bush that he had suddenly discovered that there were questions regarding the immigration status of his housekeeper and nanny. He apparently discovered the problems while filling out the documents required for Senate confirmation. I uncovered information that now leads me to question the immigration status of a person who had been in my employ as a housekeeper and nanny. It has also been brought to my attention that for a period of time during such employment required tax payments and related filings had not been made. Hmmmm… no employment taxes paid, either. I wonder how that little detail escaped his mind?